These Super Bowl snacks are hotter than a Houston electricity bill in summer and liked by Texas football fans a whole LOT more! Texas Fans Will Love These Super Bowl Snacks! The game time temperature at Arrowhead Stadium for the AFC championship game between the Kansas City Chiefs and New England Patriots was downright cold. The 20ish-degree weather tested the stamina of even the most ardent Chiefs fans. The weather will be much warmer under the retractable roof of Atlanta’s Mercedes-Benz Stadium for the final game of the playoffs. Your Texas Super Bowl party will be a temperate 74 degrees when you sit down on the couch … assuming you paid your Texas electricity bill. 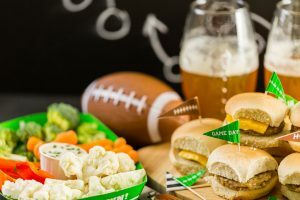 Whether you’re having just a handful of friends over, or you’ll need to satisfy the hunger of a 52-man roster, you’ll need plenty of snacks to last from kickoff through the post-game show. Make sure you have these tried and true snacks at your Super Bowl party. Chicken wings are almost always a hit with football fans and those tuning in for the commercials and halftime show. They rank as the #1 on The Daily Meal’s list of most popular Super Bowl party foods. Sauce them up however you want, and make sure you have plenty for the whole gang. If you have a white sofa or light colored carpet, you may want to skip this one. When someone drips buffalo sauce where it doesn’t belong, you’ll be hotter than a Houston summer electricity bill. A little bit of meat and a tiny bun go a long way in filling up hungry party guests. Make your sliders with ground beef, pulled pork, crab cakes, or anything that sounds good to you. Sliders fit perfectly on any plate no matter how small or how packed with other foods that plate may be. Rather than making a second large sandwich that may go uneaten, guests can grab sliders until they’re perfectly satisfied. If you’re feeling adventurous, make Food Network’s triple pork sliders. Even though it’s game day, you still need to eat your veggies. Guacamole makes it easy to get in your daily allowance of healthy foods. You can keep it simple with just avocados, tomatoes, salt, and pepper; or you can spice it up with pico de gallo, jalapenos, garlic powder, or cilantro. Make it how you like it, and your fellow fans will eat it, too. Shop For A New Texas Power Plan! Once you’ve had all the partying you can take, you can check Texas electricity prices to see if your current retail electricity provider is charging you too much. Find all the most important details on dozens of plans available in your area on Texas Electricity Ratings, and pick the one that matches your home’s power needs.